I'm cheating a little here. Thurston's Island of the Blessed is very interesting, but man is it dense. It's taking me far longer than a week to read the thing. So I'm going to pop up a children's book that I need to recommend because it is delightful. I'm using it a lot for work right now, since with the babies and toddlers I try to introduce "new" rhymes and poems to the group, outside of the popular traditional nursery rhymes that most people already know. The poems are grouped into four categories: Me, Myself and I; Who Lives in My House? ; I Go Outside; and Time for Bed. All poems in each section follow the theme. They are from such varied poets as Gertrude Stein, Jack Prelutsky, Margaret Mahy, and Dennis Lee, and poets I've never heard of but possibly should have by now. One of my favourites is by Norma Farber, called "Manhattan Lullaby" (it starts "Lulled by rumble, babble, beep / let these little children sleep; / let these city girls and boys / dream a music in the noise," -- just lovely). There are long poems and short poems, poems that lend themselves to actions and poems that lend themselves to reading. All of them are tied closely to a young child's experience either in a practical or fanciful way. As a first book of poetry, I'd say you couldn't go wrong with Here's a Little Poem. And the illustrations by Polly Dunbar. These are simple, adorable, and varied. There are little girls and little boys, and different ethnicities. There are daddies and mommies, grandpas and grandmas. The children all exude that innocent, clumsy, earnest, mischievous quality that toddlers have, and the pictures just explode with joy. They are mixed media, too. I don't know enough about art, but I can tell there's charcoal, watercolour, textures, oil paint, paper cutouts... all mixed to create an uncrowded, vibrant whole. All in all, a marvellous book. Children's librarians and parents would do well to find it; it's a relatively recent compilation, from 2007. 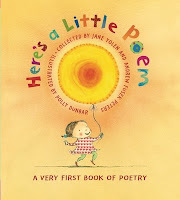 It's a great introduction to poetry, and the rhythms, sounds and subjects stand up well next to Mother Goose in appeal to little ones. Yes! I always figure that if rhymes get stuck in *my* head, they'll probably appeal to children because they clearly have some sort of language hook. And children's poetry is often so visceral.